I do! I do! Before the new company opened, one of the owners and I shared a sparse room with quite a view – it was our temporary space to transition and get the new venture up and running. It had a huge window, and outside, was a nest. 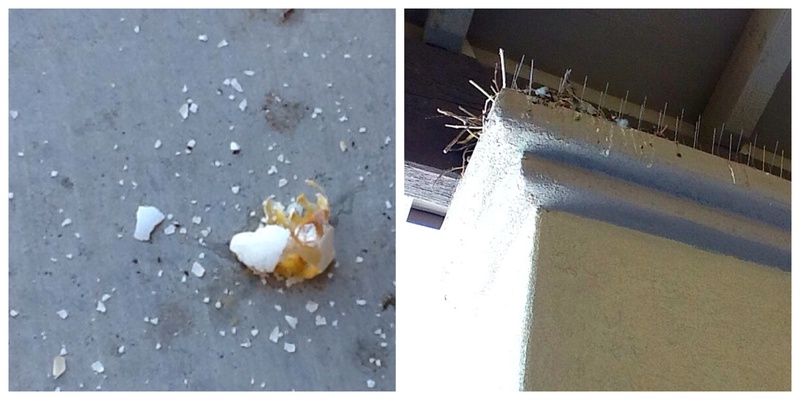 The owner of the building had gone to great lengths to install pigeon spikes. 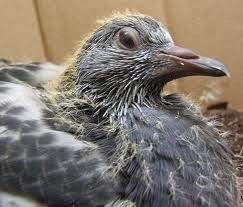 A deterrent that did not deter what first was a roadrunner, who had no success breeding up there – to a pigeon who did. Why don’t you see them? 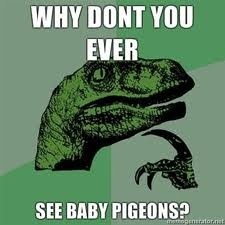 Because they don’t leave the nest until they’re full-grown! The mom was still feeding her squab when he looked bigger than her – although, he still had a little tuft of yellow baby hair on his head. Okay, so we’re in our new digs now – and everything is up and running. The suite we vacated next door was being cleaned and prepped for new leasing. I caught wind of the fact that the complex owners right hand man had orders to demolish the nest. I managed to snag him for a quick chat. “What if there is a baby up there? She’s sitting on something again!” The answer was distressing – it would be, um, ended. Now, considering I took and shared those photos of the roadrunner feasting on a small bird not so many posts ago, you might think it strange that I was so bothered by this news. That bird had no chance, already caught and nature was in session. Deliberately climbing a ladder to kill a bird is another story altogether. I pleaded to no avail. My assumption was that they dislodged the egg. Although, it was empty. Which, i didn’t notice at the time. Another week and I see a ladder by the column. A cleaning lady was outside – I ventured out to inspect the nest. A baby! The egg must have been discarded by the bird, not the right hand man. I vented in the office – until someone came outside with me to plead my case once more. I promised to clean the pavement until the baby could leave the nest – then remove the branches. She was all for it – I just hope the right hand man agrees. Posted on September 7, 2014, in Uncategorized and tagged baby pigeon, musings from the laundromat, pigeon spikes, why don't you see baby pigeons. Bookmark the permalink. Leave a comment.